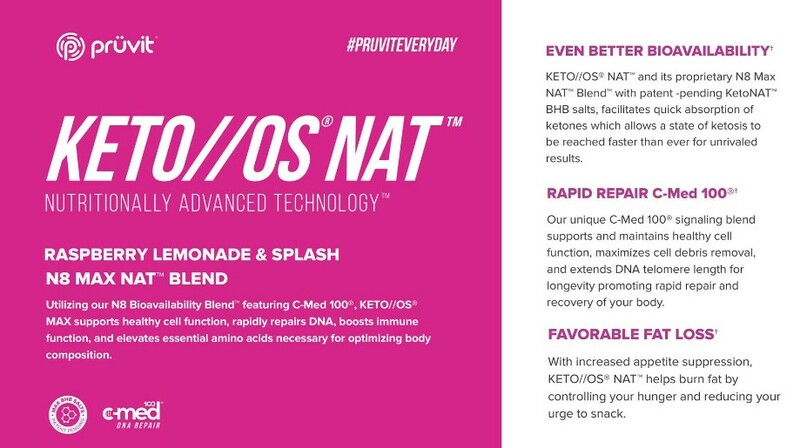 This next generation technology makes Keto NAT the first of its kind all natural exogenous ketones, bioidentical to the ketones your body makes. Using a unique and proprietary all-natural fermentation process, this new ketone technology brings greater bioavailability for maximum absorption. Keto NAT was released in two flavors, Raspberry Lemonade and Splash (watermelon-grapefruit fusion), both of which are Keto Max flavors. KetoNAT™ (R-Beta Hydroxybutyrate, L-Taurine, Fermented L-Leucine, C-Med 100). Other Ingredients: Erythritol, Citric Acid, Natural Flavor, Rebaudioside A (Stevia extract), Vegetable Juice Color, Xanthum Gum, Beta Carotene, Caffeine (if Charged version, Decaf available). Caffeine equivalent to a 16 oz coffee. Pruvit ketones have been advancing for some time and the additional of AC-11 in the new Keto Max and Keto Kreme formulas was one such advancement. C-Med 100 is the new trade name for the AC-11 DNA repair (Inner Bar of Uncaria Tomentosa) and Keto NAT contains a proprietary amount of C-Med 100. The Keto Reboot Kit also contains AC-11 within its Signal OS pills. Pruvit’s Keto OS formula uses a racemic blend of ketone salts using both the D+L isomers. Keto Max uses only the D isomer which is bioidentical to the ketone bodies your liver makes. This is one reason why Keto Max is a stronger formula (roughly 40% stronger than the OS). It has a quicker uptake, quicker spike and is more rapidly absorbed. What we know at this time is the new Keto NAT formula is more bioavailable than Keto Max so theoretically it should provide a stronger effect i.e. more energy, better appetite control, and better performance. I finally got a chance to try both flavors of Keto NAT! To me, both flavors have the same great taste, but it did give me more energy, more intense focus and I wasn’t as hungry. I love these benefits! I’m excited for this “cleaner” formula and can’t wait until Keto NAT Key Limeade comes out! Keto NAT Raspberry Lemonade and Keto NAT Splash are now mainstay Pruvit flavors! Max will eventually be phased out to be all Keto NAT formula.